When altering the front brake set-up away from the standard installation, it invariably alters the amount of rear brake bias needed to re-balance the cars brake balance. The problems start occurring when folk graft alternative brake set-ups onto the front of their Minis. Be this 7.5" discs onto a previously drum-braked model, or going from current standard disc set-ups to one of the 4-pot varieties. The question then is 'what bore size rear wheel-cylinders do I need?' Unfortunately this isn't straightforward. Actually, that's not strictly true - more on this later. The pressure developed in the lines determines brake effectiveness - aside from disc size, pad type, co-efficient of friction, etc. that is. Understanding this may assist in choosing which way you should go for your particular set-up. The basic facts you need to remember when dealing with brake pressures is how they are affected by the components you use. The amount of hydraulic pressure produced at the pedal is INVERSLEY proportional to the master cylinder bore, and the pressure produced at the caliper or wheel cylinder is the opposite to that. So a smaller bore master cylinder will develop a HIGHER line pressure than a larger bore one at the 'working end', and conversely a smaller bore caliper piston or wheel- cylinder will develop LOWER line pressure at the 'working end'. I know we're supposed to be looking at rear wheel-cylinders - but this is relatively important. Especially on racers where master cylinders and pedal assemblies may well be changed for something more, well, 'racy'. The former and following information, once ingested and understood, will help find a path through the jungle. However, a large proportion of the questions asked concern road use, so we'll concentrate on the rear cylinders now. Over the years, Austin Morris, BL, Leyland, and Rover have all had a dabble at messing with the braking systems components fitted to the Mini in it's various forms. It could be said that this has left us in a fortunate position as far as choice goes, as no less than five different wheel-cylinder bore sizes were used. All of which will fit any brake back-plate with relative ease, i.e. may need to drill the locating-pin hole on the other side. GWC1101 has a 0.625"(15.88mm) bore, GWC1102 a 0.750"(19.0mm) one, GWC1126 a 0.500"(12.7mm) one, GWC1129 a 0.6875"(17.46mm) one and GWC1131 a 0.5625"(14.29mm) one. Quite a selection as stated, but confusion is added by the use of pressure regulators/distributors. Some of which don't do any regulating of the pressure at all. *Discs with 4-pots and latest built-in servo and 7.5" discs with S-type servo, use GWC1131. *8.4" discs with or without servo, use GWC1126. *7.5" discs no servo use GWC1129. 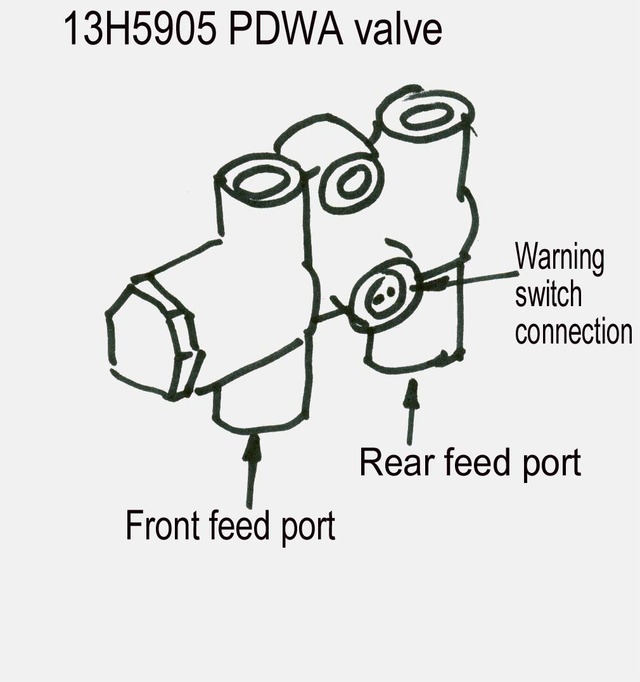 The above is presupposing NO regulator valve is used in the rear feed line as they really complicate matters, and is irrespective of master cylinder bore size - assuming a standard Mini fitment one of some type is used. I re-iterate - it's a working start. Incidentally - that thing on the bulkhead (called a P.D.W.A. - Pressure Differential Warning Activator) on early split system 'foreign' models is there purely to maintain line pressure in one half of the system in case of failure in the other. I believe these were only used on diagonal split systems. Recognised as being a large cast-iron 4-way union with an electrical connection in it located on the front bulkhead (part number 13H5905). It DOES NOT regulate/bias the line pressure when braking with the system working normally, as many believe. Some of the regulation/biasing is done in the master cylinder, the rest with the wheel-cylinders. The 'reasonably straightforward' method mentioned earlier is basically using an in-line adjustable brake regulator valve. Simple. I now always plumb in a Mini Spares Centre MS72 type between front and rear brakes, binning the FAM7821 in the process (working or not) and use GWC1102 rear wheel cylinders (cheapest of the bunch) if not already fitted. Sometimes under the bonnet by the master cylinder (easiest to fit and plumb in) and sometimes by the driver's seat (usually race-orientated stuff). 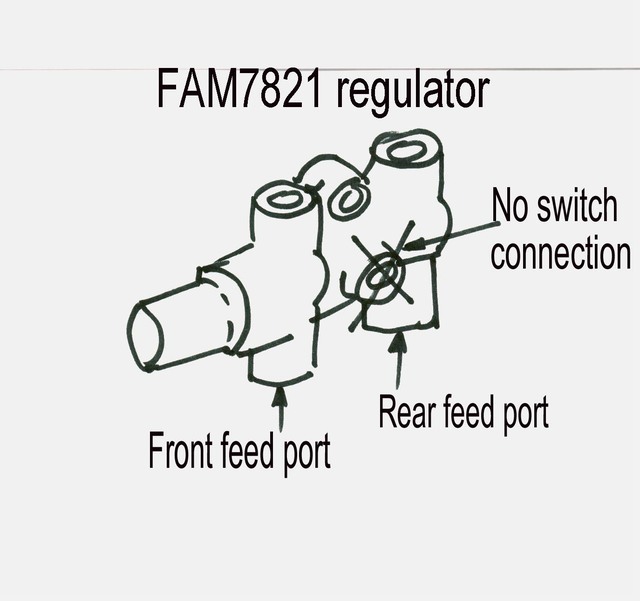 Not only does it facilitate fine-tuning of the rear brake bias/efficiency irrespective of rear wheel-cylinder size, it's generally cheaper as the correctly sized rear wheel-cylinders can be costly as can be the FAM7821 regulator valve. Make sure you get a price before ordering wheel-cylinders - some of the cost prices will make you choke! For those who already have a regulator valve on the rear subframe, trying to establish which wheel cylinder bore sizes to use with whatever type of front brake set-up you are grafting on is a real lottery. My advice to you is the same as those with a regulator strapped to the bulkhead - bin it and use an adjustable bias valve. The simplest way to do this is to either lob the standard valve bolted onto the rear subframe, and substitute it with a simple 3-way connector, or strip the guts out of the regulator valve and re-fit it 'empty'. The only problem with this is it does weird things to the braking efficiency because of the now large volume of brake fluid it holds. Then plumb the bias valve in as detailed in the article mentioned below. See 'Brakes - Split brake systems and bias adjustment valves' for further information.